Your company logo is finally finished and it’s absolutely perfect. You can’t wait to start putting it to use on signs, business cards, letter headings, your website and many other things in order to give your company a face to be recognized. But wait! If you don’t protect your logo you run the risk someone stealing it and throwing away all of the time and money you’ve invested in it’s creation. You might have the best logo in the world, but if someone else starts using it you will no longer have a unique way of branding your company. That would be a nightmare so this article is here to help you understand how to protect yourself and show you step by step the proper way to do so. Copyrights and trademarks belong in a broader category known as intellectual property protections, which also include patents. These three things were created to protect different types of creative works and many logos fall under two of them. You cannot patent a logo so we’ll be leaving that out. Logos are one of the aspects of intellectual property that can qualify for both a trademark and a copyright. What’s the difference between the two? A copyright protects “original works of authorship”, such as movies, music, digital programs, books and several other types of media and writing. The work in which you wish to copyright has to have already been created, ideas alone are not eligible to be copyrighted. Copyright’s last the duration of the author’s life and another 70 years after death. They are important in court cases as evidence against infringement of your work. A copyright cannot protect typeface, colors, designs and other attributes, but a trademark can. Many logos are able to be copyrighted but not all of them. It can actually be more difficult to get a copyright for a logo than a trademark. This might be the case if your logo incorporates an already existing symbol or design, or is made up of nothing but basic font and simple shapes. Basically, your logo has to be considered an original work of art to be eligible. There is also a $35 fee to apply for a copyright registration. A trademark is something that identifies your company and its goods or services. This can include things like logos, slogans and the name of your company’s brand. Trademarks are used to distinguish your brand and to avoid any confusion between your company and others. Technically they don’t need to be registered for you to have protection. The United States recognizes something called “common law trademark rights”. This means if you’re using a trademark you can still take action against infringement. It’s still recommended to get your logo registered for the added benefits, including solid evidence in court situations. A trademark does not expire if you register it every 10 years. The cost for a trademark application is $225. However, if you trademark your logo it can still be used by others as long as using it doesn’t make your business difficult for you or confusing for potential consumers. It can be difficult to copyright a logo, because in order to be under a copyright a logo needs to be classified as an original work. However, since copyright law doesn’t cover colors and typeface it is difficult to achieve this level of distinction. Your logo would need to be quite detailed, artistic or ornate in order to qualify for a copyright. You will only be able to claim copyright if you are the original creator of the logo, or if you hired someone to create the logo and have all of the copyrights transferred to you. If there are several people who worked together to create the logo, the people who are involved in the creation of it will be co-owners of the joint work. Before you access the website it’s important to turn off popup blockers and toolbars. They might affect the process. Go to the official copyright website here. Next, click on ‘Register a Copyright’. Then select ‘Log in to eCO’. If you already have an eCO account simply log in. If not, you’ll need to create an account. Once you’re logged in take a look at the left hand side. You should see a list of links. Right under the ‘Copyright Services’ heading there should be a link that says ‘Register a New Claim’. Click that link. Click the button at the top of the page that says ‘Start Registration’. You can also read more information about each step by clicking the other links on the page. On this page you need to select the dropdown list called ‘Type of Work’. It’ll show you a list of options. Select ‘Work of the Visual Arts’. Next, click the ‘Continue’ button. Select the ‘Title Type’ dropdown and choose ‘Title of work being registered’. Enter the title of your work in the box below and click continue. The next step asks if your work has been published. If you’ve already used your logo on anything you’ve distributed, select yes from the dropdown. Otherwise, select no. Click continue again. Enter the year your logo was created. If your logo has already been published, you’ll also need to enter the date and country in which it was first published. Next you need to select an author. If the author is you, click ‘Add Me’. If you’re not, click ‘New’. Now you need to either input a specific author name, such as yourself, or input the name of your organization. You can’t enter both. Select either citizenship or domicile from the drop down list. If you hired someone to create your logo, select yes from the ‘work made for hire’ dropdown. Select all of the boxes that apply. For a logo you would select ‘2-D Artwork’ and maybe also the ‘Text’ box. Click the save button. You’ll be brought back to the author screen but you’re done here (unless you need to add another author) so just continue on. The claimant is you, so on this step click ‘Add Me’. Fill out the same information as you did for the author step. Save and continue. If your logo has any unoriginal part in its design or if any part of it has been registered before, this is where you enter the details. In most cases this page will be left blank. If you want to make someone else in charge of your copyright, enter their details here. Add contact details of the person the copyright office should call if there are any questions about registration. After continuing, add a mailing address where documents are to be sent. Skip the ‘Special Handling’ page. Click the ‘I certify’ box and enter your name in the space provided. All of the information you’ve provided so far will displayed on screen. Look it over and make sure it’s correct. Click on ‘Add to cart’. On the next page, click ‘Checkout’. Choose how you would like to pay the $35 application fee. You may choose either a bank transfer, debit card or credit card. Fill in your payment details on the next page. Next, enter your email address and click the authorization box. Click ‘Submit Payment’. You should now see a confirmation page. 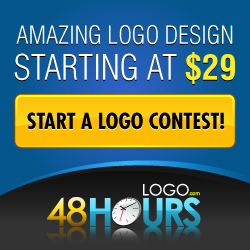 Upload your logo file by clicking ‘Upload Deposit’. Click ‘Browse’ to select a file from your computer and then click ‘Submit Files to Copyright Office’ and that’s it. You’re done. You can log back in to eCO to check your application status at any time. The trademark registering website is http://www.uspto.gov/. To quickly access the Trademark Electronic Application System (TEAS) form, click here http://teas.uspto.gov/forms/teasplus. Select ‘No’ in the section asking if you are an attorney. Now you have a large form to fill out. You need to specify who the owner is (you or your company) and fill in the name and contact details. Don’t forget to check the authorization box by the email field. This is where you upload your logo file and give other important details about it. The first thing you need to do is change the selection of Mark type to ‘Special Form’. This will cause a ‘Choose File’ button to appear, so click it and search your computer for your logo file in JPG format. After you’ve selected your file, click ‘Attach’. There are also sections to describe your logo’s words and colors. It’s important to be completely accurate when entering this information. On the next page, click ‘Add Goods/Services’. This is where you tell the office what exactly your company sells. Use the search box until you locate all of your products and services to be used with your trademark. Confirm your selection and then click either the Section 1(a) or Section 1(b) button, depending if your trademark is already in use or not. Check the ‘I understand’ box and click ‘Assign Filing Basis’. Enter your contact details again. After signing your name on the next page, you’ll need to choose how you would like to pay the $225 fee. You can choose from credit card, automated deposit account or electronic funds transfer. This is the last step and your application will be pending approval. Once you have completed the trademark application and paid the fee, you will simply have to wait until it is approved. When your logo is trademarked you will be able to use the design secure in the knowledge that you are protected, should a third party decide to imitate the logo. Check here for more info. When you see it written out it looks like a long, daunting process because logos are somewhat of a unique type of intellectual property in which trademark and copyright meet and overlap. The most important thing is that you actually do it. Your logo is important to you and your business, and its worth is much more than the time and registration costs it takes to protect it. Hopefully this guide helped steer you in the right direction and well on your way to acquiring a copyright and trademark for your new logo. Great information about Logo Copyright or Trademark, really useful info – Thanks for sharing mate!